MOVE: The Transportation Expo was a multimedia exhibition produced by the IwB in partnership with Evergreen Canada. 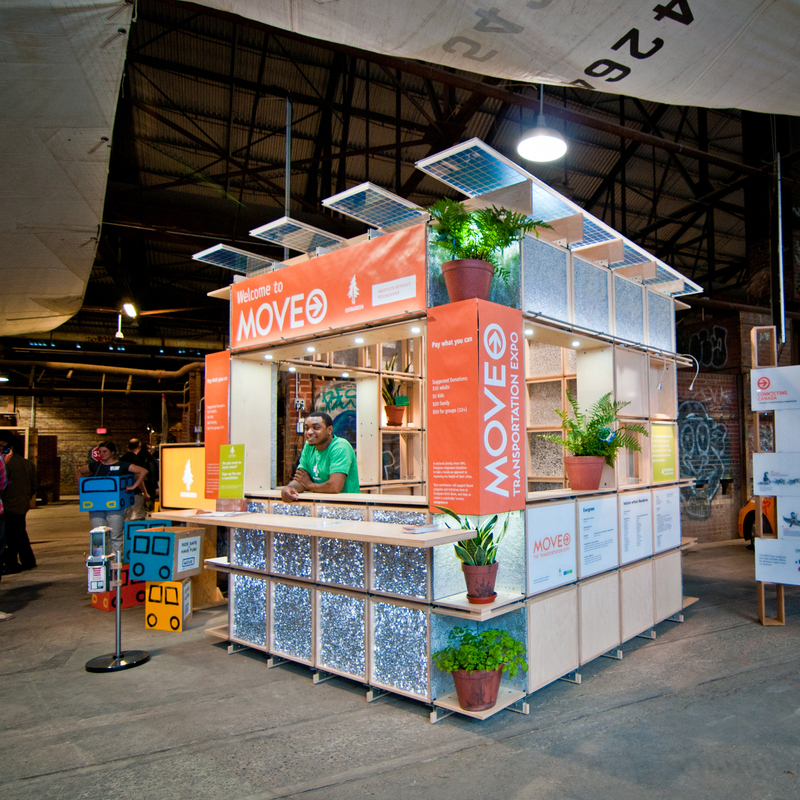 Held at the historic Evergreen Brick Works Kilns building from May to November 2012, MOVE presented a multi-sensory tour of the future of transportation and explored the innovative ideas and technologies needed to build and connect future communities in the GTHA and in cities around the world. MOVE was a major exhibition that included a series of conference talks, charrettes, and the Canühome travelling exhibit. MOVE – a multi-sensory exhibit and speaking series about the future of transportation, exploring innovative ideas and technologies needed to build and connect our communities in efficient and sustainable ways. Move: The Transportation Expo sought to connect, educate, and engage the public on transportation issues in Canada and abroad and propose innovative solutions for the future of urban transportation. The MOVE Expo visitor welcome kiosk. 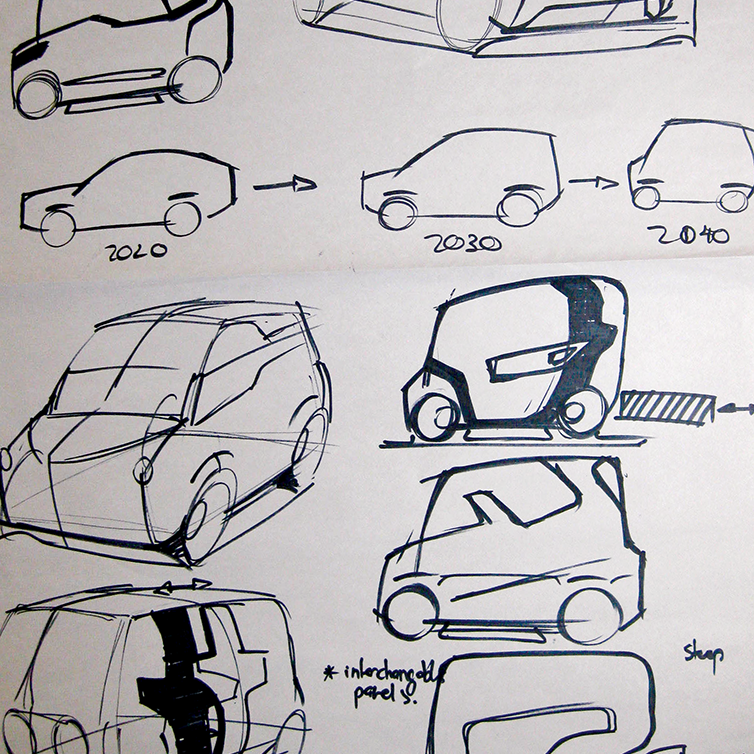 Sketches for the MOVE Expo demonstrating car evolution. 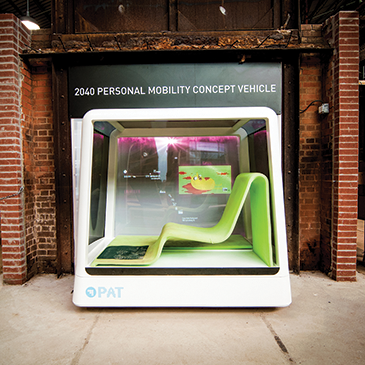 A prototype for a self-operating personal mobility vehicle. MOVE: The Transportation Expo came out of concerns for southern Ontario’s transportation infrastructure. At an average of 80 minutes per day, Toronto has one of the worst commute times in the world. Currently home to over six million people, the Greater Toronto and Hamilton Area (GTHA) is expected to grow to almost 9 million people by 2031—that means 3 million more people vying for space on already clogged highways and packed transit vehicles. The transportation sector is one of the main drivers of climate change, air pollution and urban sprawl. It is affecting our health and making our cities less livable. Outdated transportation infrastructure does not meet the needs of over half the world’s 7 billion people, who are now living in urban areas. The problem is global and wide ranging in terms of how the transportation sector is embedded in and connected to other sectors. To accommodate the economic, demographic and environmental demands of the 21st century, we must create a sustainable transportation system that addresses not only what modes of transportation we use, but also what kinds of energy and infrastructure will fuel them, and how these affect our environment. Recognizing these issues, in 2010 the IwB began working with Evergreen to propose solutions to current and future urban transportation issues. A Canadian national charity since 1991, Evergreen empowers Canadians to take a hands-on approach to improving the health of their cities. Together the IwB and Evergreen began by holding the MOVE Transportation Charrette in May 2011. The MOVE Charrette provided key research insights into the debates around transportation, it also spurred the idea for MOVE: The Transportation Expo. The MOVE Expo used the raw interior of the Kilns building to mimics a subway corridor, creating laneways for viewers to walk through and interact with window panels that showcased data, images, videos and interactive models that explored the past, present and future of human transport. The exhibition showcased historic research of major transportation innovation and current and future examples of innovation of multi-modal transit systems. Several prototypes for personal transportation vehicles and the full-scale Canühome (link to Canuhome) exhibit were also featured. Importantly, it explored how energy, land use, infrastructure, health and environment are all of critical importance for the future of transportation. Reinventing urban transportation means upgrades to roads, transit stations and communication systems that sustain it. Better infrastructure encourages environmental sustainability, improves quality of life and supports the economy as a whole. The exhibition had an enormous impact on transportation debates in Toronto and across Canada. Through the MOVE exhibit and a series of special presentations, relevant organizations dealing with transportation issues in Canada, transportation innovators, and the public were brought together to debate what our transportation systems could look like in the future. Despite the negative effects of transportation like increased air pollution and carbon emissions, rising energy and oil prices, reliance on fossil fuels for both energy production and transportation will continue to be high. The exhibition looked at ways to curb energy use through proposals for better individual and public systems of transport, and alternatives to fossil fuels. Since the mid 20th century, land-use has been characterized by sprawling, car-dependent suburban neighbourhoods and growth that is unsustainable. This has caused wide-ranging social, economic and environmental concerns like congestion and longer commute times, increased air pollution and inactive lifestyles. The exhibit looked at how we can encourage sustainable transportation through effective land-use planning. MOVE forecasted smarter urban planning that would encourage compact, dense communities built around efficient public transit and walkable spaces. Such neighbourhoods would increase our options for active transportation, reduce sprawl and allow for shorter commutes, resulting in less money spent on fuel and reduced vehicle emissions. The exhibition looked at infrastructure from the perspective of experiencing excess congestion in a city. Statistics Canada reported that roughly 86 percent of Canadians use a car to get to work. Smart, efficient infrastructure improves the health conditions of car dependent users. By integrating active transportation into everyday activities, like walking to the bus stop and biking to work, Canadians can experience active transportation. For more information on the MOVE: Transportation Expo see the Evergreen MOVE page.